Child care providers will build close relationships between family members and the children they will care for, providing continuity between home and daycare. At this very mobile stage of life children are exploring their surroundings, which require a safe environment for active learning. Primary care providers will engage one to one with children at their level and talk in a calm voice using simple language and cues from the child to direct the play. The room will provide quiet, soft areas for children to enjoy one on one interaction with staff. Music, book, nursery rhymes, finger plays will encourage language and social domains. The center will provide appropriate toys which are scaled to the infants’ size and skill development. Outdoor play will be provided in a safe, gated, playground with sufficient materials for development of motor skills such as climbing or riding toys, walking and crawling. 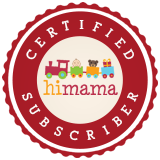 During daily routines such as diapering and feeding care providers will explain what is happening, and what is to come next and anticipate the child’s response and participation. All meals and snacks will be provided in a manner in which children can eat using fingers or utensils (depending on developmental readiness) and will follow the Canada Food Guide. Care providers will eat with the children to model appropriate behaviours and encourage social interactions at meal times. After lunch the lights will be dimmed and gentle music will be turned on to encourage a restful atmosphere. Children will each be provided with their own sleep cot and will have blankets or snuggles from home. Staff will lay with children who need support during this time and rub backs, hold hands, or just offer their support in their presence. Daily observations are conducted to provide the staff with accurate information when programming for weekly experiences. These observations will be recorded in each child’s portfolio which parents will have full access to. As well, these portfolios will provide quick descriptions of the child’s day (interesting quotes, accomplishments, toileting/diapering records, interactions and pictures). Children and parents are greeted when they arrive and spend the morning with a child care provider transitioning into the day. The program will follow a regular order in which children will be able to predict what comes next in the day. Play based experiences will be set up based upon observations of children’s interests. These experiences will build upon developmental domains such as cognitive, social, physical, creativity, language and emotional development. Plenty of time will be provided between each experience and scheduled routine so that more complex play and transitions can take place. Primary care providers will engage in reciprocal play to model appropriate play and interactions. The center will provide a wide variety of multicultural toys and dramatic play items such as dolls, puppets and a variety of dress up clothes. Art materials are provided for children to explore open ended creativity. Care providers will facilitate these experiences instead of instructing the child on how to accomplish it. The daily schedule will provide numerous opportunities for language development through finger plays, songs, stories and rhymes. 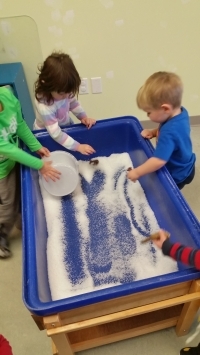 Exploratory play materials such as, water and sand table and play dough/modeling clay, paint and goop provide children with a sensory and manipulative experience. Displays of children’s art will be seen throughout the classroom and building. All meals and snacks will be provided in a manner in which children can eat using fingers or utensils (depending on developmental readiness) and will follow the Canada Food Guide. Meals will be planned with input from the parents. Care providers will eat with the children to model appropriate behaviours and encourage social interactions at meal times. Older children will be encouraged to fill their own plates and cups and clear away their place when they are finished, building self esteem and accomplishment. An opportunity for children to join in meal preparation makes them more inclined to try new foods and enjoy their meals more, knowing they helped in the preparation. As part of a healthy lifestyle we provide children with time to brush their teeth before rest time. Each child will have their own labelled brush and tooth paste and staff will assist children in this important daily routine encouraging healthy habits. After lunch the lights will be dimmed and gentle music will be turned on to encourage a restful atmosphere. Children will each be provided with their own sleep cot and will have blankets or snugglies from home. Staff will lay with children who need support during this time and rub backs, hold hands, or just offer their support in their presence. Children who do not fall asleep will be offered quiet activities will other rest. This can include books, colouring, and puzzles or for older children, assisting staff in snack preparation or set up. The outdoor play space is enclosed in a gated playground which provides numerous gross motor opportunities. There is a large jungle gym with slide, riding toys, hill for winter sliding, sand box. Play materials such as balls, hula hoops, nets and baskets, bean bags and parachutes will be available for endless opportunities. Staff will use thoughtful planning to anticipate any situations that may lead to disruptive behaviours. These situations will be avoided by planning for enough toys, using smaller group sizes, and preparing children for new experiences. When child guidance is required, staff will speak calmly with the child or children at their level and explain what the concern is for the behaviour and what the consequences are for the action. When developmentally appropriate children will be able to facilitate their own problem solving and solutions. When the solution leaves everyone feeling loved, nurtured, and heard then the Cabin 4 Kids has accomplished its goals.